If you are a fan of Star Wars: Legends (The old Expanded Universe) and a fan of the character of Mara Jade, you may find some pain here. During one of Star Wars News Net’s most recent “resistance broadcasts“, Star Wars historian and former Lucasfilm editor and archivist J.W. Rinzler, spoke about the makings of the Star Wars saga including some interesting and revealing information about the franchise, Lucasfilm, and it’s creator George Lucas. There’s a bit of context for you. Now the “Resistance Broadcast” is a Podcast, ran by Star Wars News Net. This particular “Resistance Broadcast” was being hosted by John Hoey, James Baney, & Lacey Gilleran and just slightly over 77 minute long. With Rinzler sharing many behind-the-scenes anecdotes about George Lucas, the Prequel Trilogy and Star Wars: The Clone Wars. You can if you want listen to what J.W. Rinzler said in the video below. Not only that, but see the reactions of Hoey, Baney & Gilleran to this reveal. As there was some surprise to what Rinzler said, followed by some laughter. Now here’s some information that we do know about the treatments George Lucas had written for the Sequel Trilogy. Because given what we do know about it, George Lucas would have also ignored the Post Endor EU too, telling a different Post Endor story than that of Legends. I do have some speculation of whether Mara would have been included in them, but I’ll get to that later. Facts first. For a start, one of the early villains for Episode VII would have been Darth Talon. Who would have turned Han & Leia’s son over to the darkside, with the son killing his father. 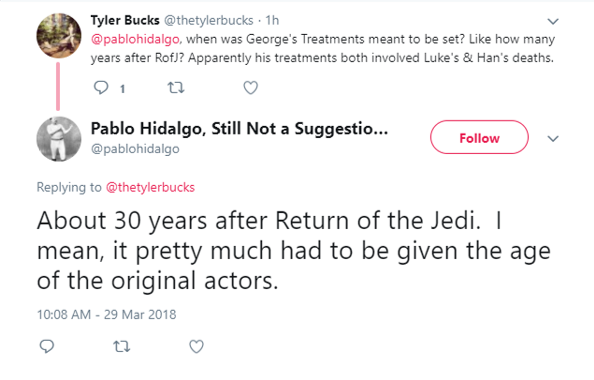 Which Pablo Hidalgo explained in a now deleted tweet. This might leave some fans wondering, if Talon didn’t appear in until well over 100 years after the events of Episode IV: A New Hope in the comics (The Legacy Era mainly comprises of Legacy of the Force and the Fate of the Jedi books, along with the Legacy Comic Series) how could she have been around (and still looking more or less the same) only 34 years after the events of Episode IV: A New Hope? Think how many stories that took place in the Expanded Universe that would have been effected by not having the births of Jaina, Jacen and Anakin Solo. As George’s Treatments only stated there was a son. Many, many Post Endor books and comics would have had to be retconned anyway. And that’s before we even get to the deaths. Yes, deaths. In George’s Treatments (you know what, I feel like I have typed that too many times, let’s turn it into a drinking game) you had the deaths of both Han Solo & Luke Skywalker. 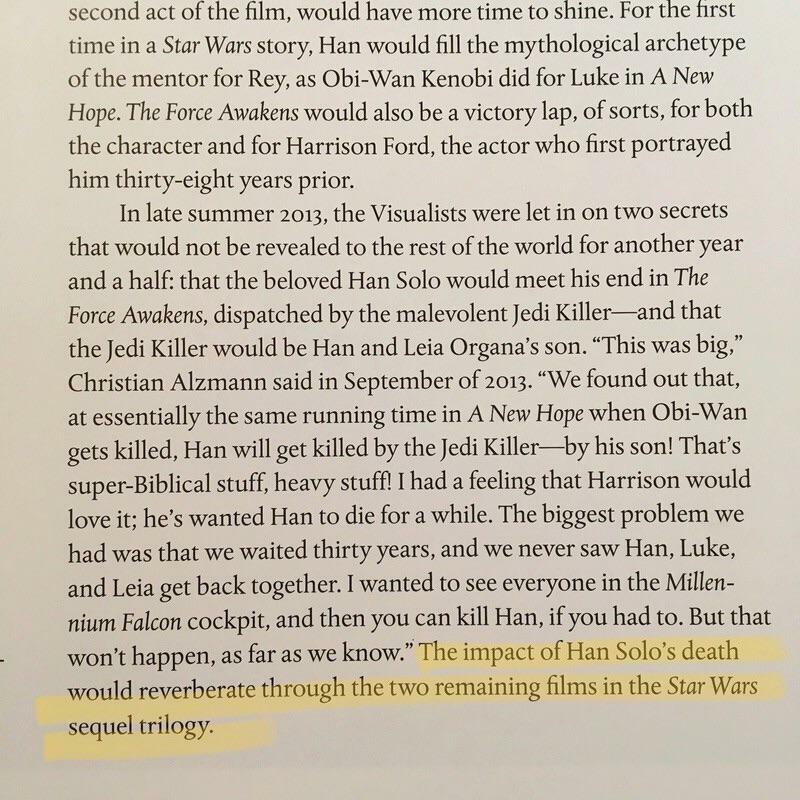 Han Solo, like his film counterpart was to be killed by his own son in George’s Treatments (bottoms up) for Episode VII. This is brought up in the Art of the Last Jedi book. And in Pablo Hidalgo’s deleted tweet. This was the first time we as fans had heard that George Lucas intended to end the ‘Skywalker Saga’ with the death of Luke Skywalker. While the original Extended Universe saw Leia trained as a Jedi Knight (although not by Luke), it also hadn’t been publicly mooted as part of the films’ storyline. 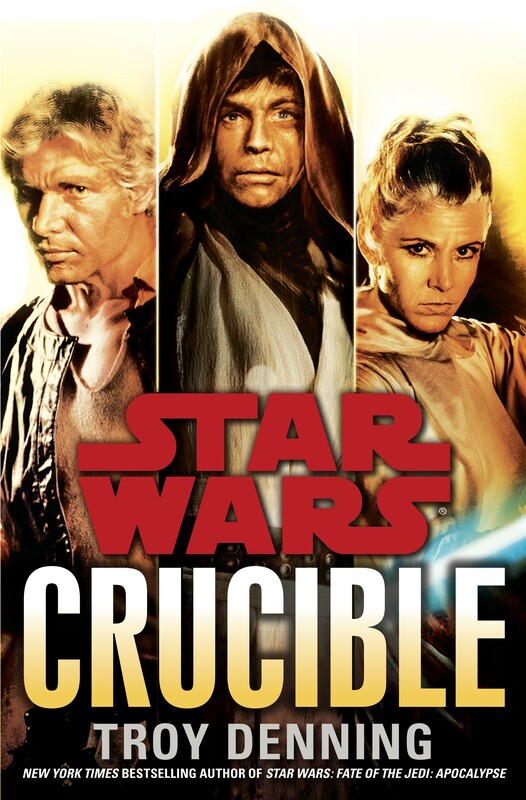 The Legends novel Star Wars: Crucible which was set in 45 ABY (11 years after 34ABY where both Episode VII & VIII along with George’s Treatments were set) still featured Luke, Han and Leia. Well if two characters (Luke & Han) are dead. And three (Jaina, Jacen and Anakin Solo) while mentioned, were never born. That book then doesn’t work anymore. Thus has to be retconned. 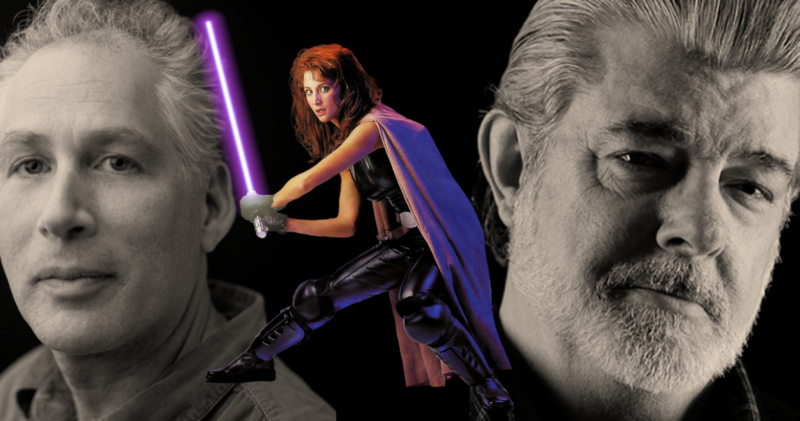 And this is the speculated bit, if George Lucas was not a fan of the character of Mara Jade. Who’s to say he would have even included her in his Treatments? He was already changing events Post Endor for his Treatments of VII, VIII & IX. So it begs the question, why add a character he doesn’t like to his Treatments when he’s already changing events form the Expanded Universe for VII, VIII & IX? But that’s speculation. We already know for a Fact through information from LucasFilm that Han was to be killed by his fallen son in Episode VII, Luke was in exile and was to die in Episode IX. 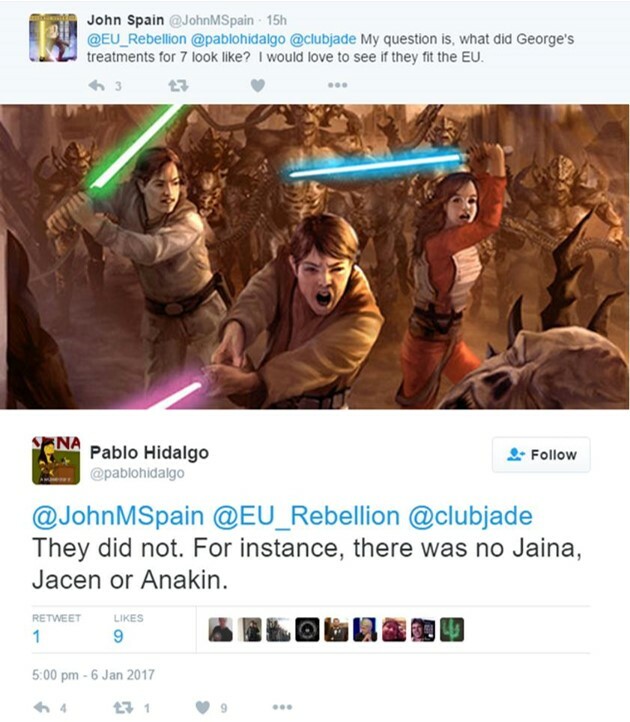 That Jaina, Jacen and Anakin Solo were not part of the Sequel Trilogy and that Talon was considered to be a villain. That right there makes a lot of Post Endor EU Non-Canon. To confirm whether or not Mara Jade was featured in George’s Treatments, someone over at the LucasFilm Story Group would have to clarify it. It’s worth asking. But all we know is that George wasn’t a fan of the character. It’s a plausible reason, but would need confirming. There has been rumours, dating back to last April that a “Mara” character would be appearing in this year’s Star Wars: Episode IX. Which continues to crop up now and then with zeroh credibility. No sources. No links. No nothing. So does this rumour even have any backing? Or any shred of evidence? One man’s word is not enough without any backing. Well this went a lot longer than I thought.